This Bat Mitzvah Haftarat Sh'kalim is written in blue complimenting the light shade of blue in the delicate Magnolia. The first sentence is emphasized with red and matches the blue and red in the illuminated caps R $ S.
Completing the arch is part of the prayer read before chanting the Haftarah. 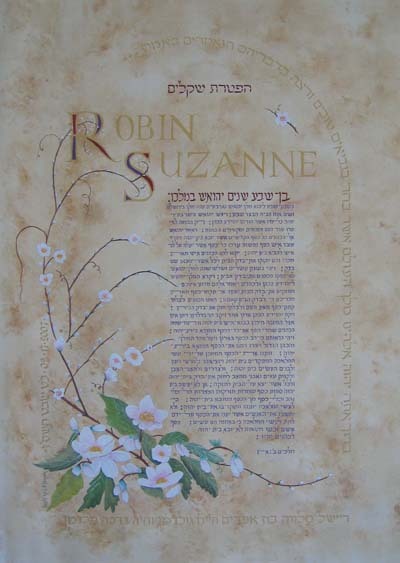 The Hebrew name of the Bat Mitzvah girl and her parents in gold paint. Paper: 140 lbs , "parchment" effect done by the artist.